It was the late 1980s when Bonham residents Vera Ross and Mae Helen Higgs, sisters, were browsing through old family photographs, letters and other memorabilia that belonged to their parents, the late Sam and Marie Smith. Some of the items got them to wondering about interesting rumors that they had heard since childhood about their family. The rumors had always been surrounded by mystery. Vera decided it was time to start unraveling the mystery, and she sent a letter to her father’s friend, Eugene Smith. Eugene’s son, John Smith, answered the letter and provided tape recordings and photos relative to Smith family history that his father had left him. In subsequent years there would be more conversations between Vera and John about family history. The whole exchange prompted John to make his wife, Letha, promise him that she would one day publish it all in book form. She did just that. To summarize the whole story, in 1815, while the Nathan Smith clan apparently still lived in Alabama, a son, named Gideon, was born to Nathan and his wife, Frances. At roughly the same time a son, named Sam, was born to Buliah. Sam and Gideon grew up as friends and playmates, neither one knowing that they were half brothers. It would be some years later, I’m guessing after the Texas Revolution in 1836, that Nathan would move his family and slaves to the Woodlawn area. 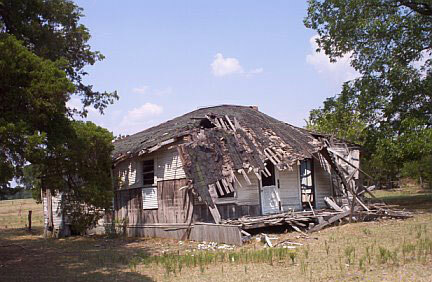 By 1851, Gideon, 36, wanted to start a plantation of his own. Perhaps by simple word-of-mouth he had heard about rich farmland in the Red River Valley area of northern Fannin County. Deed books at the courthouse show that Gideon and his father, Nathan, bought roughly 3,000 acres or more in the Ravenna-Mulberry area in the early 1850s. In making the move from Woodlawn to Fannin County, Gideon was granted permission to take Sam with him as his lead slave, still unaware of the fact that Sam was his half brother. When it comes to plantation owners in Fannin County, Gideon Smith was no minor player. With thousands of acres and roughly 30 slaves (according to the 1860 slave census, often referred to as a slave schedule) under his watch, Smith had one of the largest plantations in the county. 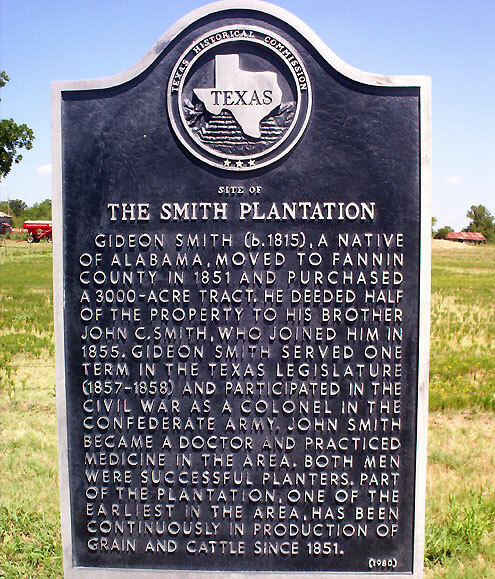 In the mid-1850s, Gideon split his landholdings with his brother, Dr. John C. Smith, after he came to Fannin County. The total number of slaves controlled by Gideon and his brother came to over 50. Their operation, which specialized in growing the obvious cash crop of the time, cotton, was no small affair. In 1853, while busily establishing his plantation, Gideon got word that his father, Nathan, had died. Gideon and his family made the trip to Woodlawn for the services. According to Letha Smith’s Blood’s Thicker Than Prejudice, while there Gideon was handed a sealed envelope containing a letter that was to be read only after his father’s death. The letter, written by Nathan, explained the love affair between himself and the slave woman named Buliah. Most importantly, the letter informed Gideon that Sam was a result of this affair. In other words, Sam was his half brother. Letha Smith further wrote that Gideon later showed the letter to Sam. (The book early on tells that Sam was given somewhat of an education at a young age and learned, among other things, how to read, a rare occurrence for a slave.) Their relationship changed forever. Although technically Sam remained Gideon’s slave, Gideon, according to family legend, began treating him more like an equal. 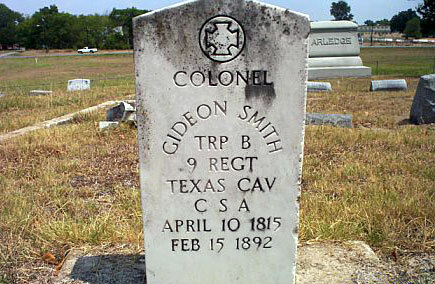 Once the Civil War started, Gideon Smith volunteered and achieved the rank of colonel with the Texas 9th Cavalry. Once the war was over and slavery was dead, all indications are that Sam Smith - as happened with a lot of slaves, Sam took on the last name of his owner - and his family, including a son named Sam Smith Jr., stayed on Smith Plantation land, probably as sharecroppers. Just as his life was somewhat of a mystery, because his name, like the names of millions of other slaves in the South, was never recorded in official records such as tax rolls, slave censuses, etc, what ultimately became of Sam Smith Sr. remains a puzzle. There are no records of when he died or where he was buried. Ironically, perhaps the only proof on paper of Sam Sr.’s life came as a result of his son’s death. Sam Smith Jr. died at his home in Ravenna in September, 1934. His death certificate, on file in the county clerk’s office (vol. 4, certificate #246) lists his father as being Sam Smith. However, as if to compound the mystery further, Sam Sr.’s place of birth is listed as “unknown”. The certificate also stated that Sam Jr.’s mother was a Lacie Williams, and that she was born in Alabama, the state that Nathan Smith, his family and slaves had originally hailed from. 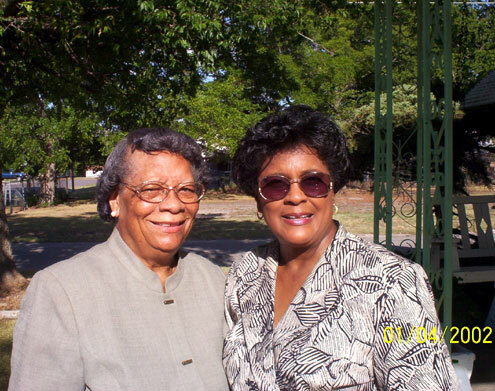 Among Samuel Smith’s children were the two ladies mentioned at the beginning of this article, Vera and Mae. The only readily visible proof today of where Gideon Smith’s plantation was located is a Texas Historical Marker located on FM 247 near Mulberry, just a few miles west of the intersection of FM 247 and Highway 78, near Red River. By the early 21st century, Vera and Mae found that keeping the land was too much work for them and their husbands, so they sold it. Though they let go of the land that belonged to them and their ancestors, including their great-grandfather, Sam, and their great-great-grandfather, Nathan, their story, and the memories of the land associated with it, will remain one of the most interesting in Fannin County history.